'Highly original . . . it reminded me of Stephen King at his best: creepy as hell, but with compassion for every character however misguided.' Jake Kerridge, Daily Telegraph 'Deliciously macabre... it vies with the darkest imaginings of the Brothers Grimm' Observer * The multi-award-winning international bestseller. 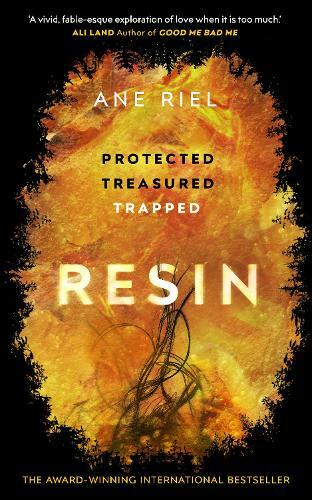 Suspenseful and heart-breaking, Resin is the story of what can happen when you love someone too much - when your desire to keep them safe becomes the thing that could irrevocably harm them. * Liv died when she was just six years old. At least, that's what the authorities think. Her father knew he was the only one who could keep her safe in this world. So one evening he left the isolated house his little family called home, he pushed their boat out to sea and watched it ruin on the rocks. Then he walked the long way into town to report his only child missing. But behind the boxes and the baskets crowding her Dad's workshop, Liv was hiding. This way her Dad had said, she'd never have to go to school; this way, she'd never have to leave her parents. This way, Liv would be safe. * 'A chilling story about the lengths a man will go to protect his family and way of life. Liv and the terrifying place she manages to survive in will stay with me for a long time. ' Claire Fuller, bestselling author of Our Endless Numbered Days 'This haunting, claustrophobic novel about love and obsession . . . chilling . . . a moving tale of love that morphs into madness.' Daily Mail 'An unsettling story about a family in trouble and the lengths a father will go to to protect his daughter' I paper 'A vivid, fable-esque exploration of love when it is too much.' Ali Land, author of Good Me Bad Me 'Liberatingly original. Exceptionally gripping.' Karin Fossum `Absolutely brilliant - such detailed layering of character, moving and creepy as hell. So original and beautifully written and I couldn't wait every night to read it - the mark of a truly compelling book.' Fiona Cummins 'Darkly brilliant. As beautifully written as it is page turning - an original and compelling voice.' Kate Hamer, author of Girl in the Red Coat * Resin is the winner of Scandinavia's most prestigious literary awards: The Glass Key, The Golden Bullet, Best Crime Novel from the Swedish Crime Writer's Academy and The Harald Mogensen Award.